"You will not find a more professional real estate agent than Rina. She provided consistently competent advice in all the stages for the sale of our house in NW Washington DC. She has great knowledge of the local market, and is very helpful from staging to marketing, to ending in a successful sale. A call to Rina will be returned immediately, which reassures you as a seller. When it came to the last stage-- negotiation of final price-- Rina's advice was invaluable. Her demeanor --calm, gentle, and always well- informed-- is also very helpful in every instance" - Fernandez A. "Rina is a joy to work with. Her no pressure approach, keen listening skills and sensitivity to headaches and heartaches that can accompany moving made my experience painless and mostly effortless. She is resourceful when suggesting solutions and has established relationships with the best local trades- people that she is generous with sharing. She was available at all times without interfering or pushing me where I didn't want to go. The move went so well I barely remember it! Thanks Rina." - Jo B. "Working with Rina was an absolute delight. At each stage of the process, she was informative and responsive. Rina was infinitely patient in responding to our requests and needs. She was well organized and focused in moving the process forward efficiently to a successful conclusion. We are only sorry that we only had one house to sell!" - Jim H.
"Rina helped my father and I with the sale of our home of over 40 years. The house needed some attention to get it ready for sale and Rina was able to refer a number of qualified contractors which made it quick and easy to get the work completed. When the time came for the Open House, the house looked wonderful. We had multiple offers on the house and it sold well above the asking price." - Beth C.
With over $150,000,000- in Real Estate sales, Rina Kunk has been recognized as one of the area’s “Best Local Real Estate Agents”, and has received the Washingtonian’s “Best Of” award in 2016, 2017 and 2018. With Rina as your REALTOR®, selling a home has never been easier. Her years of experience accurately pricing homes, skillfully negotiating contracts and using creative marketing to maximize your homes exposure all add up to a REALTOR® who considers client satisfaction a top priority. In real estate, “web appeal” is the new “curb appeal”. Rina uses her extensive tech background to create a competitive edge for her clients. With the use of digital marketing, predictive analytics, social media targeting, email campaigns, and listing placements on prominent national web sites as well as all local realtor web sites, Rina leverages the full power of the internet to her client’s advantage. Rina takes care of the details so you don’t have to! She arranges all aspects of the house preparation phase so a house shows at its best. Coordinating the various steps to prepare and list a home is Rina’s specialty. Rina holds the Graduate REALTOR® Institute or “GRI” designation and is a Certified Residential Specialist. This is a distinction held by only 5% of the REALTOR® population nationwide. She also has specialized training in assisting older adults with their real estate needs, and holds the Seniors Real Estate Specialist® designation, SRES. 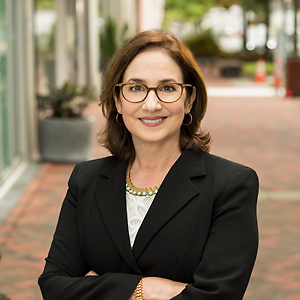 As a native Washingtonian, born and raised in DC and Bethesda, Maryland, Rina has close ties and lifelong knowledge of the metropolitan area. She attended Holy Child High School in Potomac, Maryland and graduated from The Catholic University of America in Washington, DC, where she received a B.A. in Education. She received a Masters of Clinical Social Work from the University of Maryland at Baltimore. Rina currently lives in the American University Park neighborhood of Northwest Washington with her husband and three sons. Rina’s teaching and counseling skills have been helpful to both her buyer and seller clients. She understands the importance of educating clients about the process of buying and selling real estate, and ensures they have the information they need to make good decisions. For Rina, providing clients with exceptional service is her #1 priority.